From purchasing transactions, to chatter from social networks, to web server logs, to satellite imagery, to traffic flow sensors, it's estimated that we now create--every two days --as much information as we did from the dawn of civilization up until 2003. What's more, it's expected that the amount of data currently available will double every two years world-wide as virtually everything becomes digitized. The insights provided by Big Data--the massive volume of information too complex and dynamic to be able to process, store, analyze, and man-age with traditional data tools--enable organizations to make better decisions, improve efficiency, decrease costs, and increase revenue. Yet many companies don't even realize its benefits...and if they do, may still not know how to take advantage of it. * Foster an information-centric culture, and enable your employees to develop new operational, tactical, and strategic plans based on real data instead of calculated estimates. * Know what products to digitize, and how best to utilize public data marketplaces containing already-collected information that could benefit your organization. * Determine the best way to analyze the data you have using open source tools, analyses, and technologies like Hadoop and MapReduce. * Establish clear guidelines for respecting your customers' privacy. * Put the right security measures and procedures in place to protect your organization's and your customers' data, including a crisis plan in the event that you get hacked. 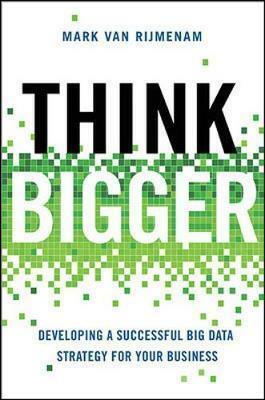 Think Bigger examines Big Data's impact on specific industries, as well as the use of mobile and real-time data. The book takes a clear-eyed look at the growing use of sensor-enabled devices, and the rise of the "quantified self," as more and more consumers use technology to track everything from how much they eat to how many calories they burn. You'll discover how to use gamification tactics such as check-ins, badges, and loyalty programs to generate vast amounts of data in a user-friendly and engaging environment. Big Data has already begun changing the way business, and even society, is operated. Think Bigger is an essential resource for ensuring that your company isn't left in the dust. Mark van Rijmenam is Co-founder and CEO of Datafloq. Datafloq is the One-Stop Shop for Big Data, creating the Big Data ecosystem by connecting all stakeholders within the global Big Data market. He is an entrepreneur, a well thought after international public speaker and a Big Data strategist. He gives advice to major organization on how to develop and implement a Big Data strategy. He is co-founder of 'Data Donderdag' a bi-monthly (networking) event in The Netherlands on Big Data to help organizations better understand Big Data. Big Data--the enormous amount of data that is created as virtually every movement, transaction, and choice we make becomes digitized--is revolutionizing business. Organizations can use all this data to glean valuable insight into how best to serve their customers. Big Data is drastically changing business, with companies that have implemented a Big Data strategy financially outperforming their peers by 20 percent. But in order to make sense of the vast amount of information available--from terabytes, to exabytes or even brontobytes--your organization needs to use the right algorithms, tools, and metrics...and it must have a Big Data strategy in place. This book gives readers everything they need to develop a profitable Big Data strategy...and reveals why it's not something organizations can leave to the IT department. * Walt Disney World introduced the "MagicBand" wireless wristband to collect real-time location data, purchase history, information about riding patterns, and more, enabling them to make better decisions, improve the park's offerings, and tailor marketing messages while providing a magical experience for their guests. * Nike improved business, sustainability, quality, and cost by tracking materials in a vendor index, and adding value to their supply chain. * Purdue University helped students achieve their maximum potential--and boosted retention--by tracking engagement, performance, risk, and feedback for remarkable, award-winning results. The book reveals how any organization, large or small, can make a business case for Big Data initiatives, prepare for the next wave of soon-to-be in-demand positions such as Big Data Scientists and Managers, and use technologies like Hadoop and Mapreduce to make sense of the data they have. The book makes sense of the latest trends including the mobile revolution, gamification, the Internet of Things, the quantified self and more, while looking ahead to the future of this remarkable development in how business is done. Correctly managed, Big Data can help you get to know your customers and clients in real time, improve your products, personalize your pricing, identify risks, improve customer support, and identify new markets. Filled with easy-to-understand explanations and case studies across various industries, this book maps out a blueprint for Big Data done right.